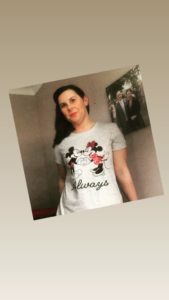 I’m currently rocking my new Micky and Minnie T shirt, which I picked up last week from George at Asda!. Its soooooo darn cute, I love it! . Regardless of if you are coupled up or single, I hope you spend today doing something you LOVE. It can be as simple as taking the time to curl up with a good book, or to watch your favourite movie or Netflix show. It could be taking a lovely long bubble bath after a day at work. Maybe meeting a friend for a catch up over lunch or a cup of tea. Get moving your body too – get outside to take a walk or take a class . 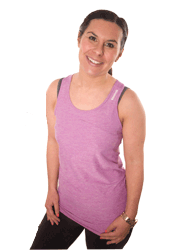 Exercise is such a brilliant mood booster and will help strengthen our hearts!. Taking the time to look after our mind, body and soul is so, so important. When we take the time to look after ourselves , we are reminding ourselves we matter too. It also helps us give our best self to others around us, instead of burning ourselves out trying to juggle so many things and finding our own self care dropping further and further down our priority list – hands up if you have also been there! . So Start treating yourself like your own best friend – after all we spend 24/7 with ourselves so we need to be happy in our own company. Take note this week too as to how you talk to yourself – would you talk to a friend the way, you talk to yourself?. Become your own little cheerleader. “Think positive Thoughts and they will shine out of your face like moonbeams and you will always look lovely” Roald Dhal. So on this day of Love – show all your loved ones how much you care and also include yourself on that list too!. Love yourself enough to move your body, nourish it with healthier food choices and believe that you can achieve anything you set your mind to. 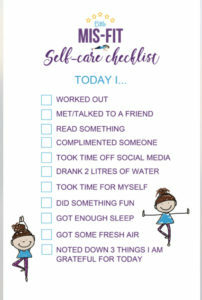 Use our self care check list as a reminder to take care of yourself too!